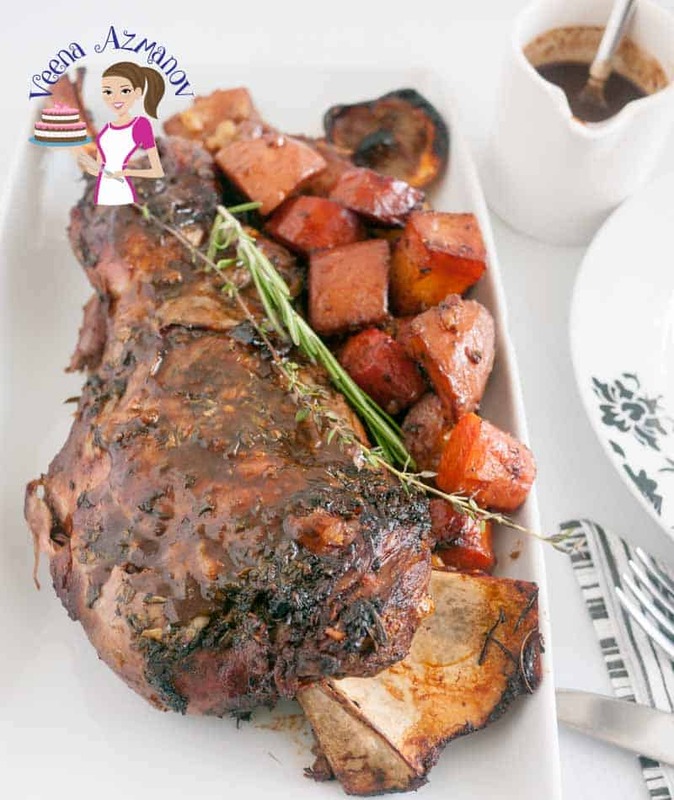 This succulent roast lamb shoulder is cooked low and slow keeping it soft and juicy. Infused with a mixture of fresh herbs such as rosemary, thyme and cilantro and some robust red wine, which results in a delicious gravy. A perfect crowd-pleasing recipe to serve when entertaining. Slow Cooked Roast Lamb Shoulder in Red Wine Sauce, #Roast lamb shoulder. If you love meat that falls off the bone? Then this one’s for you!!. Nothing like a slow cooked roast lamb shoulder that melts in your mouth. The best part is you barely have to do much because the oven does all the hard work for you. Now in our home, we cook special meat cuts of lamb when it’s festive. The kinda expensive piece of meat you know. So cooking it well becomes as important. I made this recently when we had the festival of Sukkot. Finished a bit wedding cake order, and boy was I tried? Had to think of a way I could dinner ready after a long busy morning. Of course; I did not want to spend the rest of the day cooking a festive dinner. But kids are excited!! And you know festive means good food! So this is what I made!! Slow Cooked Roast Lamb Shoulder. Simple, delicious, melt in the mouth and in addition – less work more wow factor!! My kinda food! Wouldn’t you love to dig into this juice tender meat? This one was hands on about 15 minutes – went and watch Minion 3 with the kids while the lamb shoulder went into the oven for 2 hours with a little basting every twenty minutes, then 5 minutes to make the gravy and voila dinner is served. Kinda feels quick. Lamb Shoulder is quite a fatty cut of meat really so it a great cut for slow cooking. It stays really juicy and tender. What’s even better is that compared to a leg of lamb, lamb shoulder is usually a little less expensive. I’m using what the butcher class Oyster cut – looks very similar in shape to the leg of lamb really. 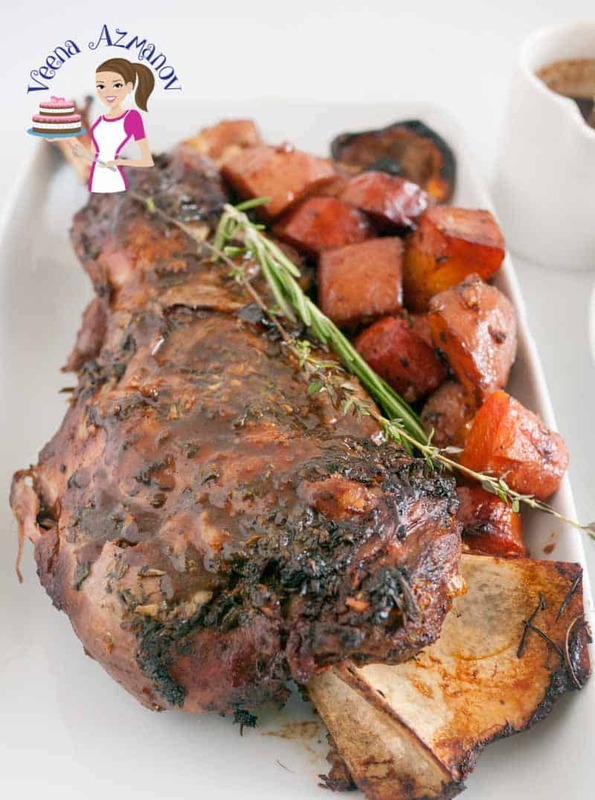 Herbs – Rosemary, thyme, Parsley / Cilantro – Now lamb with rosemary and thyme are the classic herbs that go so well together. I love to add a third to add a bit more. Often I prefer to use Parsley but my kids are still not so use to parsley – it kinda stands out for them. So often I will substitute cilantro for parsley. Having said that you know I’m a big fan of the cilantro. Red Wine – The rule of thumb – always use a good red wine for cooking one that you would drink is your best guide. If you cook with wine often it’s best to add a bottle to your weekly shopping list. 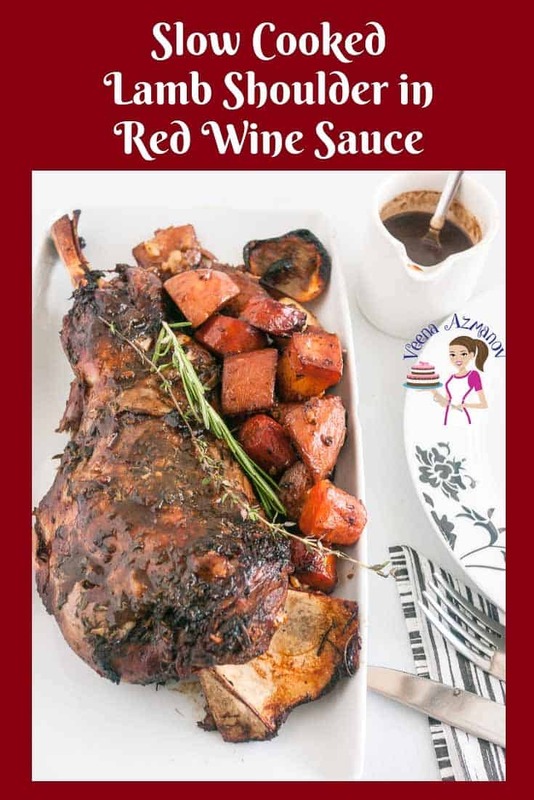 The red wine in this recipe gets flavored with all the wonderful veggies and herbs and the resulting gravy/ sauce is absolutely delicious. Vegetables – I used carrots, potatoes, onions, and lemon – but you can also use parsnip and sweet potatoes. If you do use sweet potatoes cut them into large chunks as they cook must faster. I highly recommend the onions and lemon, the onions caramelize and give the shoulder so much sweetness, the lemon juices off over the lamb again adding so much flavor. Stock – ideally you could use water too! I personally prefer to use chicken or vegetable stock. But again if you don’t have the stock go ahead and use water. The lamb is full of flavor so you won’t be missing anything. 2 sprig each rosemary, thyme and parsley / cilantro. Coarsely chop all the marinade ingredients then rub it in a mortar and pestle. Sear the meat on a HOT grill or saute pan. Rub marinade and set aside. Prepare all the vegetables cutting them into large chunks so they won’t’ get too mushy in the oven. Add veggies to the roasting pan. Spread the remaining herbs around the pan. Pour the stock and red wine around the shoulder in the pan. Loosely tent the roasting pan for the first 60 minutes so the juices won’t’ all evaporate. Keep basing the lamb shoulder every twenty minutes with the juices in the pan. If you find that too much of the juices have evaporated – add 1/2 to 1 cup water. If you stick a fork in you will find the meat is fork tender. To make the gravy simply remove all the vegetable aside. Place the roasting pan on medium heat. Add 1/2 cup water 1/4 to 1/2 cup red wine. Scrape the pan to remove all the caramelized bits of veggies, herbs, and meat. Sieve the gravy to get a nice brown sauce to serve with the lamb shoulder. 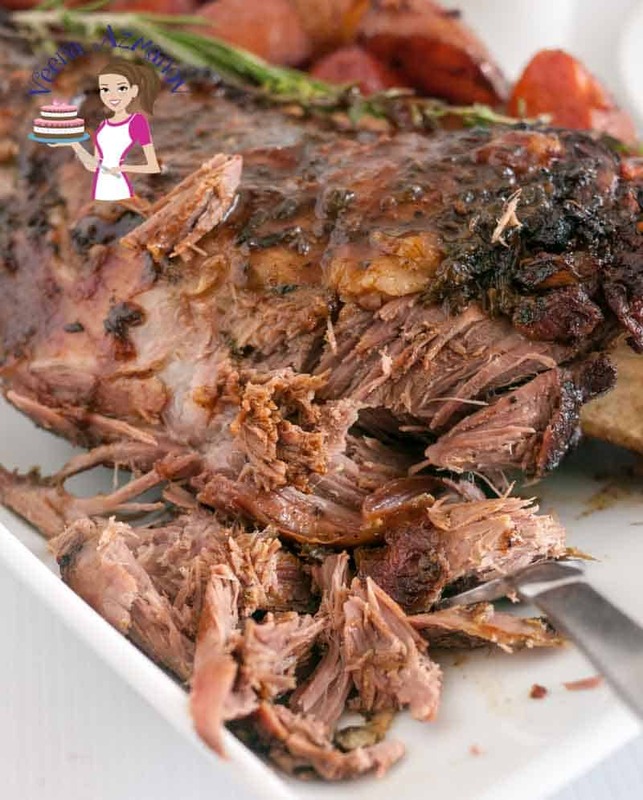 This succulent slow-cooked roast lamb shoulder is cooked low and slow keeping it soft and juicy. Infused with a mixture of fresh herbs such as rosemary, thyme and cilantro and some robust red wine, as a result, you get a delicious gravy. Prepare all the vegetables cutting them into large chunks so they won't' get too mushy in the oven. Loosely tent the roasting pan for the first 60 minutes so the juices won't' all evaporate. Thank you for going into detail about the oyster cut. I would love to take a butchering class so I can learn more about the cuts and where they come from and of course how to cook them. I make an eye round but my hubby hates it because he says its too lean and tough. I never really had lamb growing up as we ate more seafood and chicken but I have grown to love it. And I don’t like it with mint jelly like all the cheesy tv shows say you are supposed to eat it. 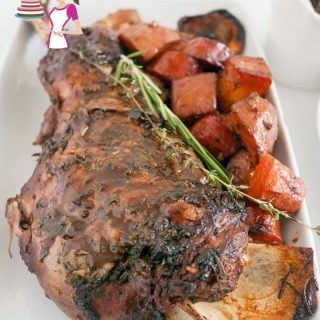 Slow roasted with rosemary and garlic sounds heavenly! I know exactly how you feel Jennifer. I too don’t like all that cheesy mess they show on TV – all wasted calories that do nothing. But yes it is important to learn these things if you are interested the more you learn about food the more your cooking will improve as well. I love slow cooked foods, but I’ve never tried doing lamb. What a gorgeous piece of meat, so fall apart tender but with that beautiful color and sauce. It’s amazing you can get such a fabulous dish without standing over a stove all day. Great recipe! Absolutely Sarah. – You can leave it in the oven and do much more… makes this dish even more desirable to me. This looks like a lovely Sunday supper. I’m sure it makes your house smell fragrant, too. yes it makes a great Sunday or festive dinner. and oh smells so good. I don’t cook lamb at home. But this one looks so tender and juicy and perfect with red wine sauce. I think I have to change my mind and make this one. 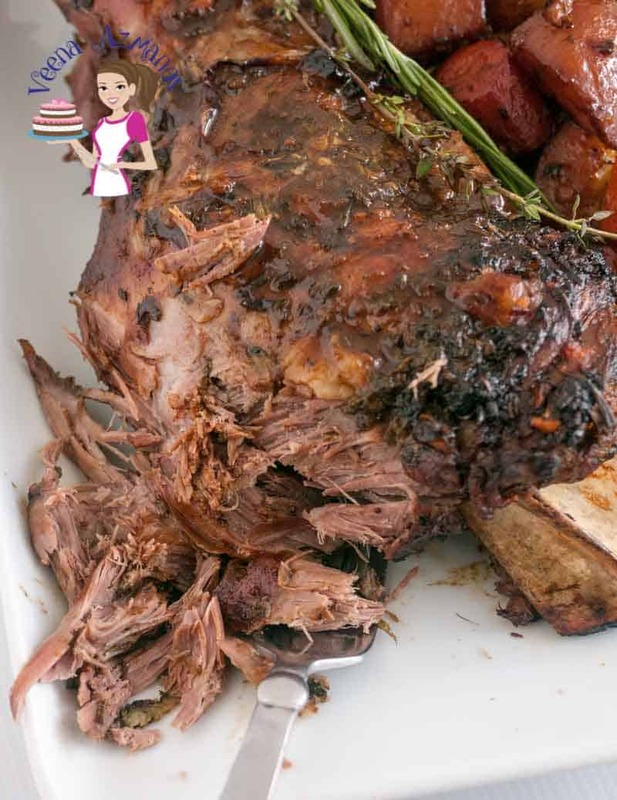 Oh you must try Swathi – cooking lamb at home is super easy.. Slow roasted meats are delicious! 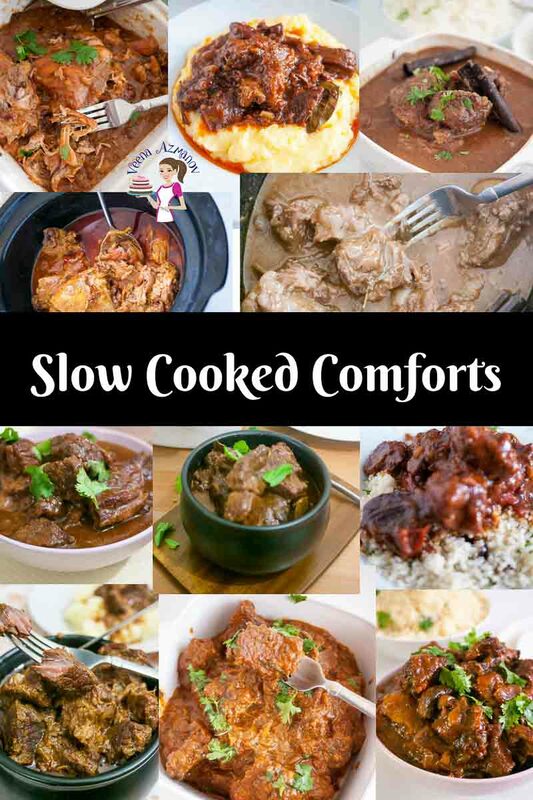 They’re so tender and full of flavor … I love using my slow cooker for roasts. Carrots and potatoes are the perfect combination to accompany roast. I’ll be sharing this recipe. Ok…so WE totally love LAMB in our house. I just did a lamb stew in red wine…that will be on the blog this week. The first time I had lamb it was NOT a hit. Unfortunately my late mother-in-law was not a great cook. However, I prepare it much differently, and have used lamb in MANY recipes. Always, and I mean ALWAYS love it. This sounds so delicious. It’s been literally years since I have eaten lamb! Isn’t that a shame? I just love the look of this dish! The lamb looks so tender, moist and sounds super, super tasty! I really do need to try this one very soon. I wish I could grab a fork and eat right off that screen! Lamb is one of my all time favorite roasts. I love the look of your red wine sauce – yum! Mine too Kylee. I love lamb very much…The red wine sauce was really yum… you must try. This looks so delicious – and perfect for Sukot! We usually do a leg of lamb for Pesach, but I will try a lamb shoulder this year. Inexpensive is always better, and slow cooking is such a great way to ensure that everything stays tender. This sounds like the perfect meal for a special occasion or festivity. The meat looks fall of the bone tender and the marinade ingredients YUM!!! Yeah absolutely Kathy.. I love making such things on special occasions. The meat is tender and just falls off the bone.. I love cooking with red wine as I know anything cooked in red wine is delicious! 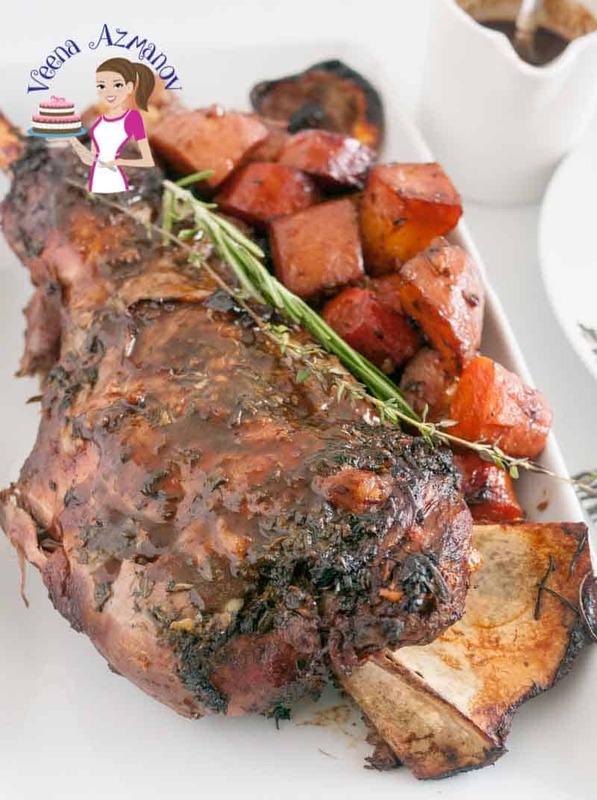 However, I have often been intimidated in trying lamb but seeing how delicious your lamb turned out, I think I should really get over my fear and try it beginning with this yummy recipe!! This looks beyond delicious and I love that it can easily be made in the slow cooker! What a great family dinner – can’t wait to give it a try! Thanks Kim. Yeah I’m sure you can make it in a slow cooker too. Thanks Stephanie.. I love cooking with wine especially red meat. This roasted lamb looks sooo delicious Venna. Meat is so tender and marinade sounds fantastic! I just KNOW I would enjoy in these dish because lamb is my favorite meat and there’s a red wine included hehe 😉 Sharing this! Lamb slow cooked with all that herbs and wine must taste good. I find it interesting that you paired this with all those veggies.. This is a lovely recipe. Lamb is my favorite red meat. So sweet and where I live in Australia, it is extremely popular. And slow cooking is so suited to a shoulder of lamb, my favorite cut as well. Just perfect for a cool winter’s day. Really nice job. 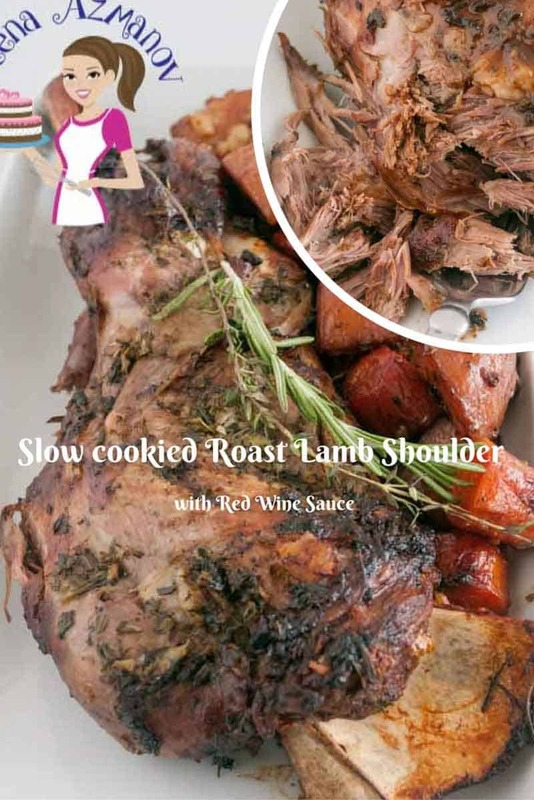 Exactly… slow roast is perfect for lamb shoulder. Works great. This is some comfort food I can get done with especially during these cold winter months. I love slow roasting meat until it’s fall off the bone tender. This looks like one delicious lamb shoulder! Oh yeah lamb is pretty easy… just pick the right cut for the right recipe and it makes cooking it easy peasy. Oh my goodness this looks fantastic! We love lamb but haven’t had many other cuts of lamb besides ground and chops. We have some friends who raise grassfed lamb, I’ll have to get some shoulder to try this recipe! We love lamb, and this recipe sounds so good. I will have to give it a try soon. Perfect for leftovers too. Looks delicious! Slow cooking with the herbs and wine must really make this amazing! Perfect for cold weather! Thank you Melissa – Yes it was delicious!! Perfect for cold weather too! Oh my goodness I can almost smell it cooking with your mouthwatering pictures! I bet it tastes as good as it looks, can’t wait to try your recipe! Your lamb looks delicious. Slammin’ recipe. I have to try this soon. LOVE the color and flavors Thanks! oh that lamb looks ridiculously tender and I imagine that gravy is absolutely delicious. You are really making me hungry now. Thanks Becky – Yeah that was so tender and the gravy was really delicious. I don’t eat lamb that much because I never know how to cook it, love the idea of putting it in the slow cooker. This is my kind of recipe!